A metal L-shaped tool with a square socket at one end, used for operating the paddles on lock gates. Also known as a lock key, an essential narrowboat piece of equipment. Also known as a lock key. 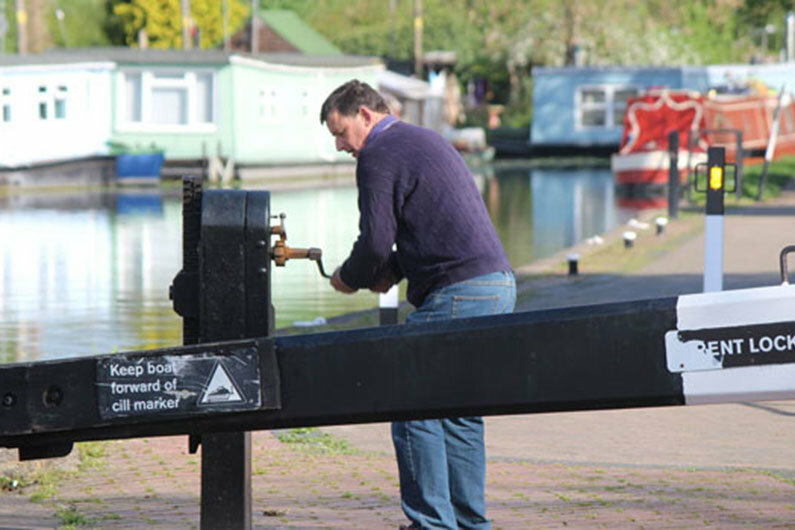 You will need these when operating most manual locks on your narrowboat. Different length ones can be collected over the years as the clearance on some balance beams does not always allow the use of long versions. Available in ratchet style for assistance in winding, light weight aluminum, or traditional steel. What is also useful is a big magnet on a rope for attempting to retrieve windlasses when we drop them in! If your windlass is aluminum or stainless steel though you’d better be prepared to get wet or get a grappling hook. These materials are not magnetic! More recently to the market are engineered windlasses with built in gearing. These require little more than a fingertip touch and are ideal for those without good arm strength. Also new to the market are carbon-fibre windlass, providing a feather-light solution. When completing a lock flight a windlass weighing around 285g (10 oz) would be a welcome relief to a traditional cast-iron windless which have been around for more than 200 years and are much heavier. However, be aware that despite the lightness of this windlass, they do not float and can’t be retrieved from the water with a magnet! On the Calder & Hebble a proportion of the locks are operated with a wooden handspike, basically a length of timber 1¾ x 2¼ x 3’ used as a lever in the unique lock gear. Use hardwood if making one as softwood will split due to the effort required.